-BP Watch: Adolfo Carrion's last speech, what local residents think of his legacy, and who is planning to run in the April 21 special election to replace him. -Neighborhood landlords seem to be pushing out current tenants to make room for homeless families, who come with a hefty rent check from the city. -Community groups are hoping to get a serious community benefits agreement from the Kingsbridge Armory developer as a condition of any financial incentives from the city. -Bronx politicians turned out in force to welcome a new immigrants' rights center to the Bronx. -City Council Members debated the future of Bronx parks. -A look at why the Blockbuster on E 204th St. closed. 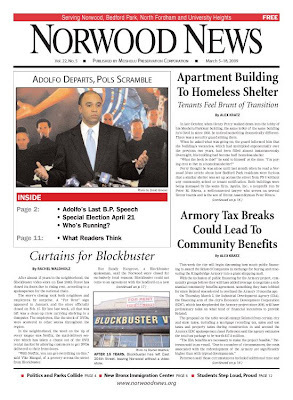 -Editorials on the Kingsbridge Armory, housing the homeless, and the broken windows theory. Plus plenty of school news: Samuel Gompers High School students debate race and identity, PS 94's step team, and heartbreak for the women's basketball team at Lehman College. And, as always, check our Neighborhood Notes section and our events calendar at Out & About to find out what's going on this month.